The majestic Hickory Nut Gorge is a 14-mile-long canyon that cuts a picturesque pass as deep as 1,800 feet through the Blue Ridge Mountains. Abundant in undisturbed forests, waterfalls, and granite cliffs, the Gorge is home to the communities of Gerton, Bat Cave, Chimney Rock, Lake Lure, and Bill’s Creek. The rushing waters of the Rocky Broad River cut through the gorge, home to an ecological treasure of 37 rare plant species and 14 rare animal species. In 1927, the dam at Lake Lure was built, creating the famous centerpiece of the Gorge. Overlooking the lake is the famous Chimney Rock 315-foot monolith, opening to visitors in 1885. 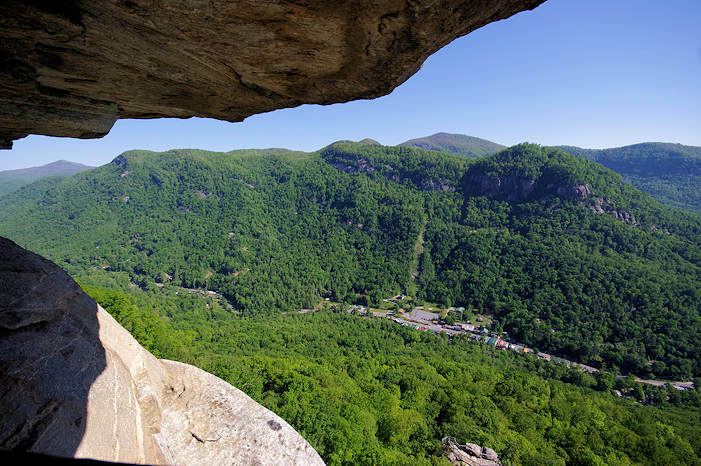 The heart of Hickory Nut Gorge is only 25 miles from downtown Asheville and 17 miles from downtown Hendersonville. A family vacation tradition for many for generations, experience plenty of outdoor adventures, relaxing inns, charming shops, a day on the water, or a stroll along the river. Romance and charm converge here with a storied history in a stunning setting. Chimney Rock at Chimney Rock State Park: The best views of Hickory Nut Gorge are from atop this famous, towering monolith. See our big Chimney Rock Guide. 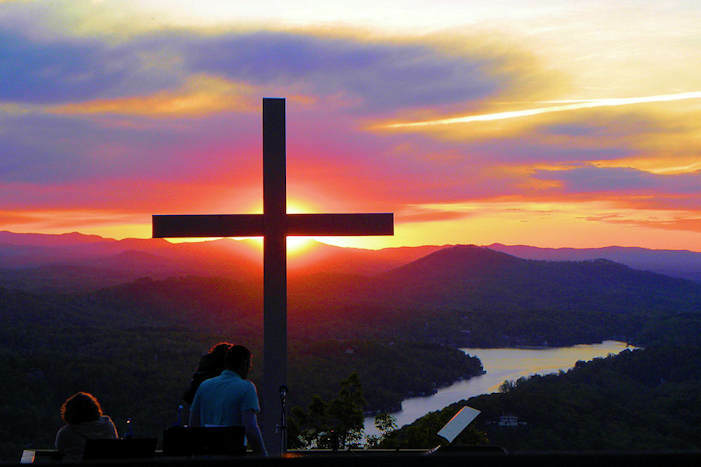 Lake Lure: There are many ways to enjoy one of the state's most beautiful lakes. 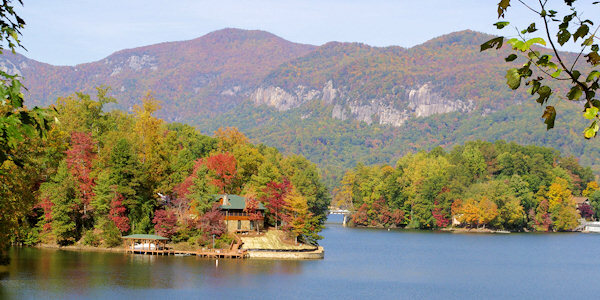 See our Lake Lure Guide. Bearwallow Mountain: Hike a two mile-loop to the top of this grassy summit near Gerton for wonderful panoramic views. See our Bearwallow Mountain Guide. Trombatore Trail: Hike 2.5 miles to Blue Ridge Pastures for views of the gorge. Read more. Wildcat Rock Trail: Hike 3 miles on this new trail to Little Bearwallow Mountain by Carolina Mountain Land Conservancy, with 1,800 feet in elevation by cliffs, 100-foot cascade and panoramic views from Wildcat Rock. See our hike guide. Weed Patch Mountain Trail: Hike or mountain bike 10 miles to Eagle Rock on the new trail that starts at Buffalo Park in Lake Lure. Read more. 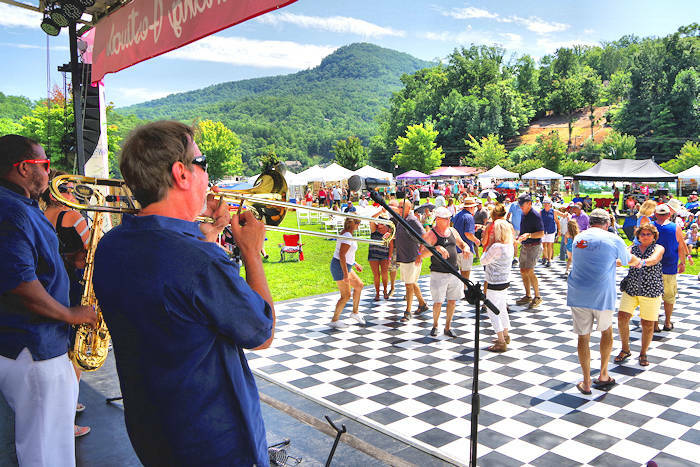 Events: Read more about favorite annual events like the Dirty Dancing Festival, Chimney Rock Easter Sunrise, New Year's Polar Plunge and Santa on the Rock. Village of Chimney Rock: Browse through the gift shops and enjoy a meal in a restaurant. Located behind the downtown buildings, stroll over stone bridges and boulders along the Rocky Broad Riverwalk by the river. There are several locations along the highway to take a dip in the chilly waters. Lake Lure Flowering Bridge: Officially dedicated in October 2013, see the blooms covering the historic 1925 Rocky Broad River bridge in Lake Lure. 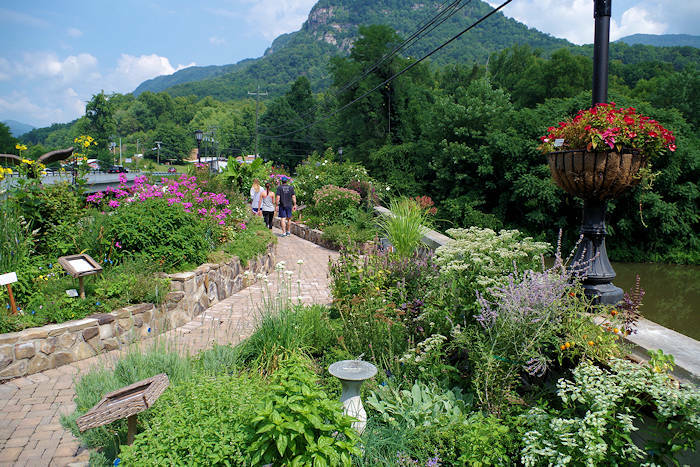 The bridge was closed to traffic in 2011, volunteers came together to create gardens on the 155 feet of the bridge and along the Town Center Walkway that continues past Morse Park and Lake Lure Beach. See our Flower Bridge Photo Gallery. Morse Park: Enjoy beautiful vistas of the mountains of Hickory Nut Gorge at this lakeside community park. Great for picnics, bird watching or relaxing by the shores in your lounge chair. Take a lake tour from the marina. Stroll the lakeside boardwalk to the beach. Stop by the Visitor Center for more area info. Lake Lure Beach: This summertime favorite has 100 yards of clean, sandy beach and swimming area. There's also a small water park, change area, snack bar and picnic tables. It's open from Memorial Day to Labor Day with a daily admission fee. Buffalo Creek Park: This new trail for mountain biking and hiking snakes upward in a 3.5-mile loop that climbs approximately 500 feet through forest terrain and boulder fields. More trails will open soon. Read more in our Lake Lure Guide. Black Mountain Rag State Scenic Byway: Starting at exit 64 off Interstate 40 at Black Mountain, this scenic route is named for an old fiddle tune about the dark green Lauada Firs that give the Black Mountains their name. In musical terms, a "rag" is a tune with multiple twists and curves up and down the scales. This scenic route twists and turns through the mountains like the music itself. Coming from Asheville, turn right off the exit ramp at Black Mountain and follow NC 9 south towards Bat Cave. The road winds along the Rocky Broad River, joining Hickory Nut Creek near the end. Turn left on US 64 East to proceed to Lake Lure. Drover's Road State Scenic Byway: Drive from Asheville to Lake Lure on US 74A & US 64, twisting up the ridge to Gerton and back down to Bat Cave and Chimney Rock. Hickory Nut Gap Farm: Tour this working farm between Chimney Rock and Asheville with store and deli. 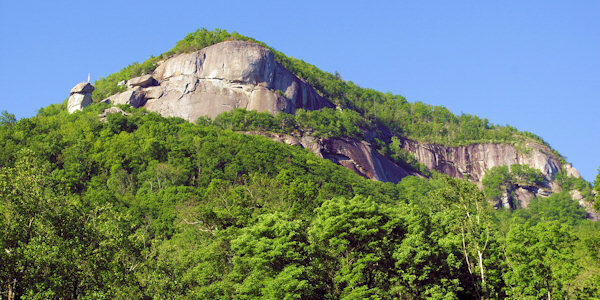 Rumbling Bald Mountain Hike: Now part of the Chimney Rock State Park, this is a popular spot for rock climbing, bouldering and hiking. The loop trail takes you through forests along the base of the cliffs. Read more. The Lake Lure Golf Club is a great nine-hole public course offering a challenging golf game amidst the beautiful scenery of Hickory Nut Gorge. The course is open year round and has a clubhouse, driving range and two putting greens. The course is located at the southeastern end of town along US64/74. Fishing: Fish along the Rocky Broad River, so named after several floods deposited rocks and boulders mid-stream and along the banks. The river, regulated as undesignated trout waters, can be accessed along the Highway 74A/64. For season dates and regulations for each type of trout water, contact the NC Wildlife Resources Commission (WRC). A valid North Carolina fishing license and trout license are required for all streams. Directions: From Asheville, follow U.S. Highway 74A East to Bat Cave. Take 74A & Highway 64 to Chimney Rock and Lake Lure. It's 17 miles east of Hendersonville via U.S. Highway 64.